We’re getting near to the end of the era of the 100-Page Spectaculars, not that I knew that at the time. This issue of SUPERMAN represents one of the last I’d ever purchase, bought as usual from my local 7-11. I’ve had two or three copies of this book over the years–not quite sure what happened to the first, but if I had to guess, I think I probably traded it for some other comic somewhere along the line. The lead story is a nice bit of nostalgic confection, even though most readers could figure out the big twist in it from just the cover and this splash page. 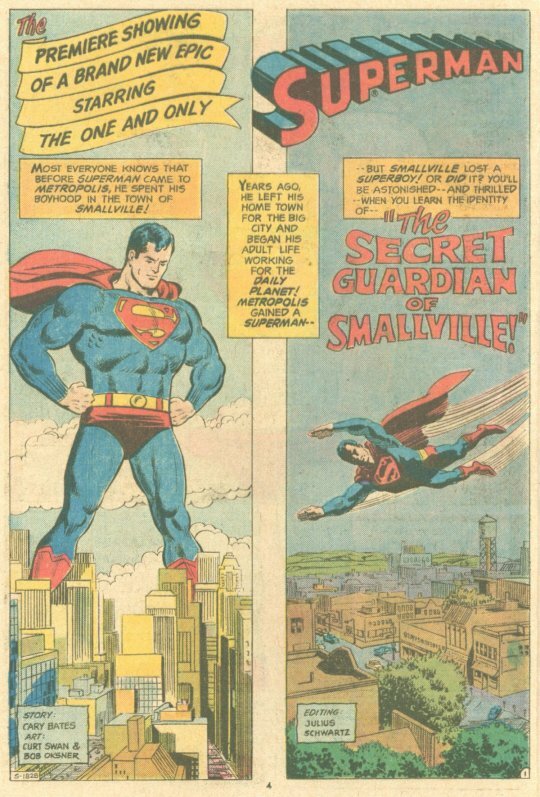 It sported nice Curt Swan art ably inked by Bob Oksner, probably my favorite Swan inker of the period. The story opens as Clark Kent gets a phone call from his boyhood friend, Pete Ross, who asks him to come back to Smallville as there are strange things afoot. As SUPERBOY readers will remember, Pete is aware of Clark’s caped identity. That evening, there’s a sudden earthquake and Pete is struck by falling debris. 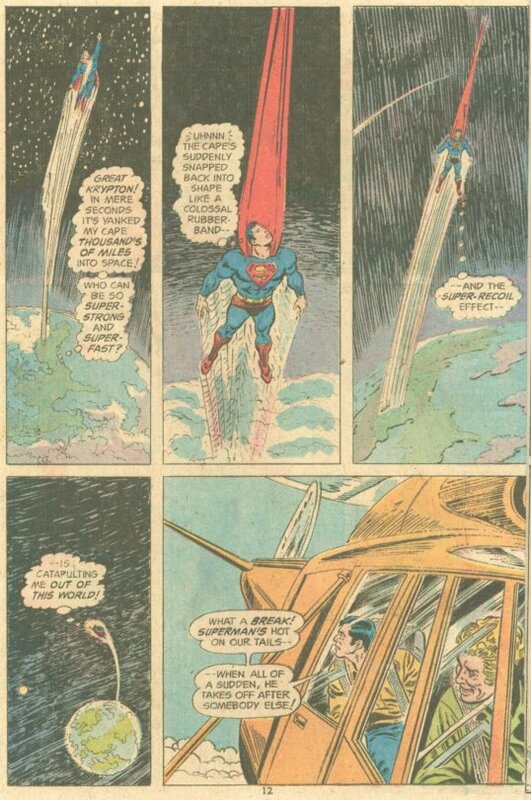 But though only half-conscious, he sees Superman appear to deal with the emergency–or at least thinks that he did. 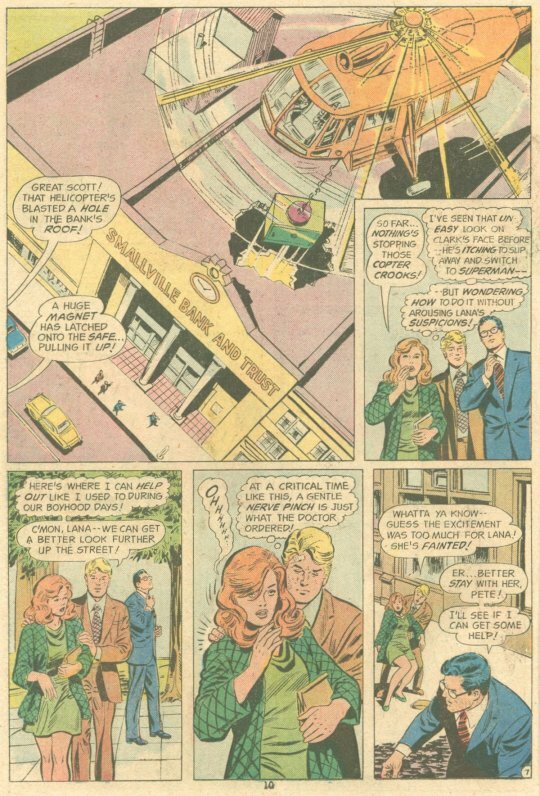 The next morning Clark turns up, and he and Pete rendezvous with Lana Lang, who tells Clark that she’s here working on a story. Apparently, for the past decade there hasn’t been any crime or natural disasters in Smallville at all. Rather than being grateful for the good fortune, Lana smells a story and wants to investigate. But immediately putting the lie to her premise, the trio sees a gang of criminals stealing the vault right out of the Smallville bank. 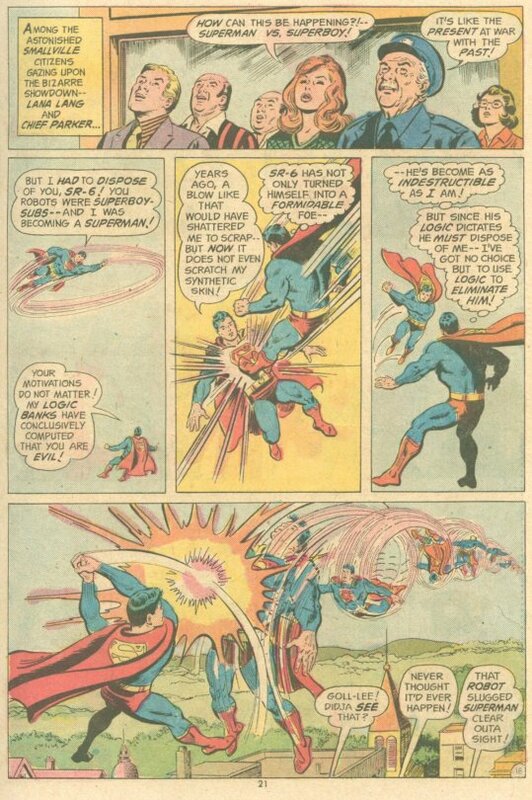 Superman moves to intercept the crooks, but before he can, he’s intercepted by a fast-moving figure that hurls him into outer space, before itself waylaying the escaping felons. It’s all very mysterious. But after some thought, Pete Ross thinks he’s got the score figured out, and heads to the old Kent house. And he’s right. The mystery savior is the last of Superboy’s old robots, who borke his programming when Superboy ordered his robots to destroy themselves by flying into the sun. Since that time, he’s worked in secret to protect Smallville, and also somehow made himself immune from the pollution effect that caused Superman to get rid of his other robots. 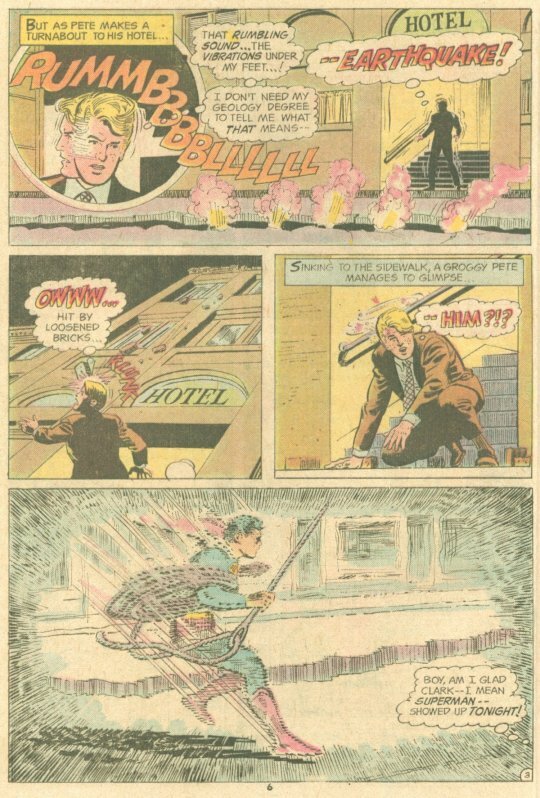 Superboy warns Pete not to reveal his secret as he jets off to deal with another emergency. But as he does, Superman, who can’t leave well enough alone, engages the Superboy robot. The robot, however, views Superman as an evil being who tried to kill him, and becomes homicidal, kicking Superman all over the place. In the end, Superman poses as elderly police chief Parker and fakes a heart attack seemingly caused by the robot. 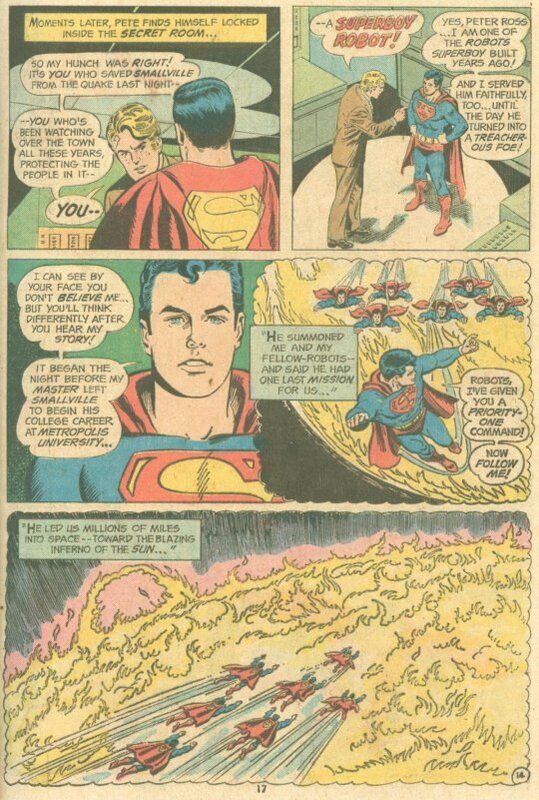 Having caused the death of an innocent, the Superboy robot flies himself into the sun, destroying him. And so, crime and disaster returned to Smallville. Thanks, Superman! After this came the collection of reprints, starting with this story in which Superman competes in an Interplanetary Olympics–and loses. 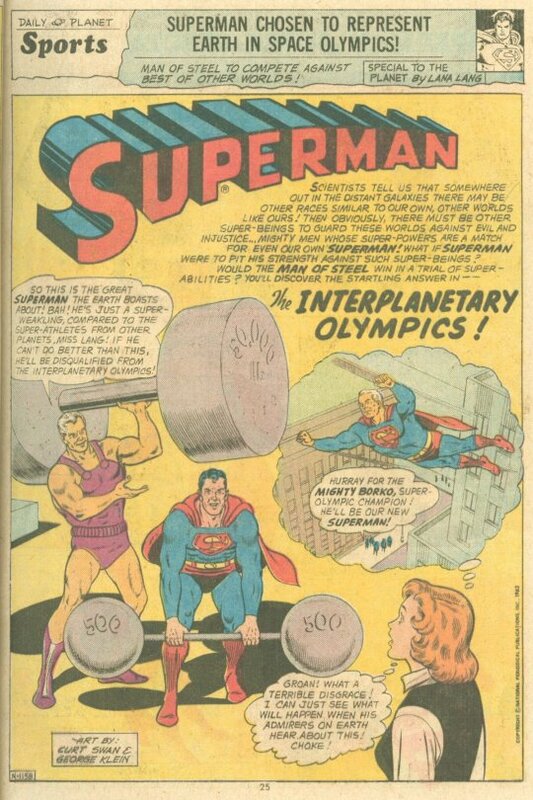 Turns out the Olympics was all an elaborate ruse designed to let alien bad guys siphon off his super-energy as he performed his feats, but being smarter than them, Superman failed to perform, and thus left them without anything to siphon. For a change, Lana Lang was also featured prominently in this story. 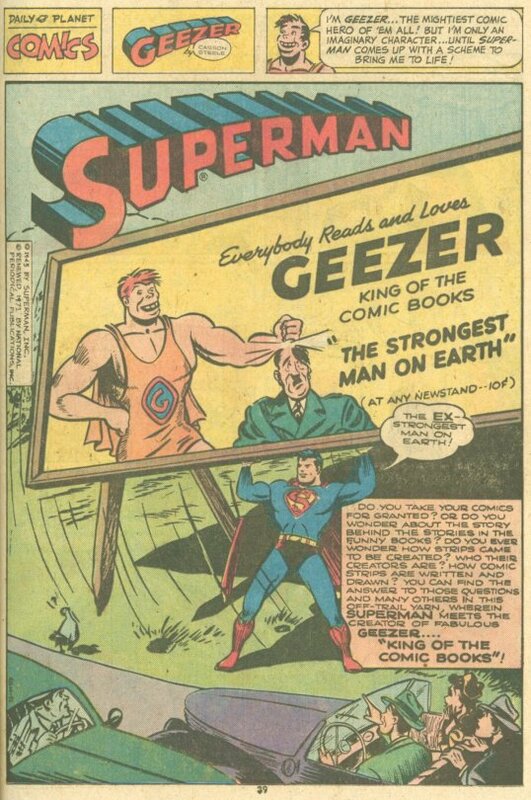 Then came a golden age story in which Superman aids a thinly-disguised version of Jerry Siegel, who is the creator of Metropolis’ favorite comic book character, Geezer–kind of a cross between Superman and Li’l Abner. Siegel’s stand-in is threatened by Nazi agents, but the real problem is that he’s allowed ghosts to take over the writing and drawing of his popular character while he sits back and answers fan mail. It’s a bit of a damning self-critique. It’s followed up by another golden age story, this one marred by shaky reproduction, in which Superman helps a modern day Alice in Wonderland. After that comes one of my favorite Superman stories–and a premise so good that Mort Weisenger did it at least twice. 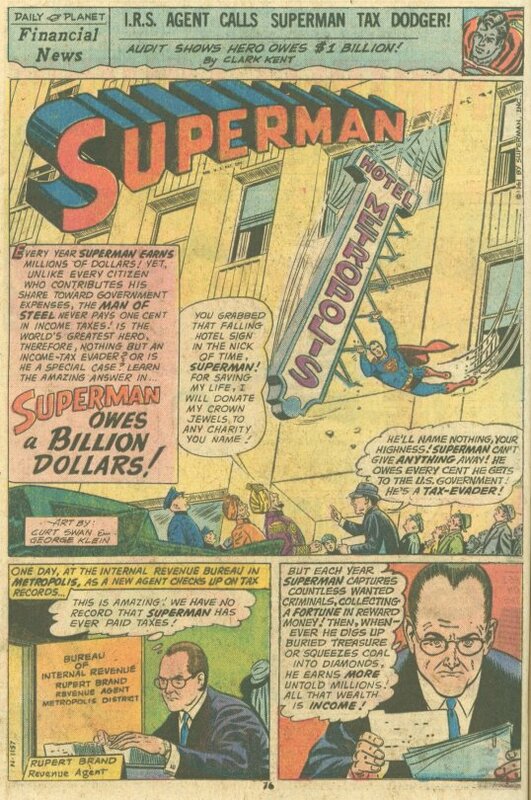 A zealous IRS agent discovers that Superman hasn’t filed any tax returns, and thus owes the government a billion dollars in taxes on all of the rewards he’s claimed and turned over to charity. Despite Superman’s best efforts, he is foiled at every turn in his efforts to come up wit the money before the tax deadline. In the end, though, Superman’s debt is nullified, as he’s allowed to claim the entire world as a dependent, thus reducing his tax liability to zero. And finally, we close out the issue with another early story, in which Clark Kent is witnessed being blown to pieces in a gas explosion. With no way to alibi, Superman instead begins to adopt a succession of new identities, but each one is befouled by circumstance. 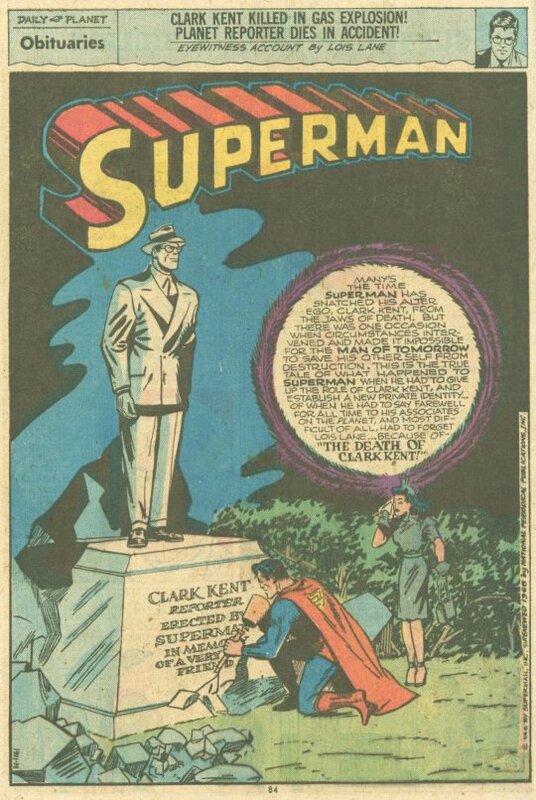 But dumb luck allows the man of Steel the wiggle-room he needs to resurrect Kent, and so the status quo is maintained.